By elmeaux, February 12, 2013 in Mighty Muggs! This new line was shown at Toy Fair and I was kind of interested. Yesterday I saw them at retail. They are blind boxed, and they are $2.99 each. I didn't realize exactly how tiny they were going to be! Minuscule! It's just crazy that they want three bucks for what amounts to a gumball machine toy. So, they can't sell the line at regular scale, so last year they shrink them down some and try again. Those didn't really take off it seems so this year they shrank them down more to see how that does. Next year they'll be rebranding these as Microscopic Muggs and will include a magnifying glass with each figure. not a fan of these. I really liked the original stuff and don't mind the next lvl down but these do nothing for me. Seriously. That would be like charging $4-5 for a single Minimate! Bought two the other day before i even knew they were a thing. Talk about disappointing. Won't make that mistake again unless there's ever a Hawkeye or Jean. I'd like to get a couple of the Iron Man Armors but that's about it. Where are these being sold at? Except these have no articulation or accessories so there's far less perceived value than a single Minimate...ymmv. Sorry for the late reply; it was at Target. Target is the only place I've heard of them popping up at brick & mortar. While they are not the full size or even the Mini-Muggs I still dig them being a fan of all things Iron Man. That are not that small at 2", they have a nice width to them and way beyond capsule toy size and quality IMO. I feel like they're a decent value for $3, I don't feel ripped off and compared to some of the designer toy market stuff they're a bargain. I just have a strong dislike for blind box figures in general. Being a sucker for all things Iron Man and with my said dislike of blind box packaging I caved and bought a fresh case from Target to make sure I got a set in one shot. 3 complete sets of 12 figures in the case (case says collect all 24 but don't mention that's split across 2 waves). If you look at the box it's the 12 on the left side in wave one. That all said I have an extra set of 12 if anybody is interested in them from cost + shipping. My cost on the set is $39 after tax. I can ship them either USPS First Class Mail ($3-4) or they will just fit into a Priority Mail small flat rate box for $5.80. Just shot me a PM. 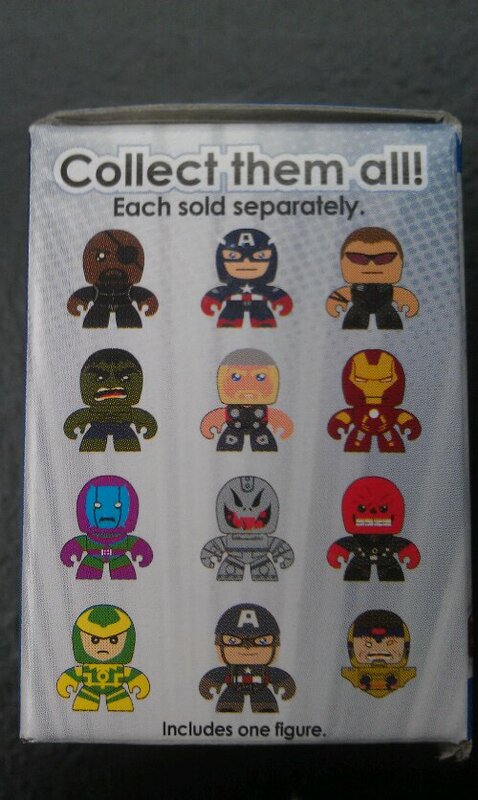 Being a HUGE fan of Mighty muggs and having nearly two complete sets of every single mugg...and customs. these Micro Muggs are absolutly terrible. Its like they took the remaing stock of plastic they had from the might muggs and tried to come up with a way to use it up. It looks like they got hit with a frying pan in the back. seriously they couldn't mold their heads entirely sphearical? Mini Muggs were a stretch, but atleast they kept the qualty the same just in a smaller scale. the micro's are an embarresment. Thanks guys, I did end up finding them at my Target and picked one up......not entirely sure which Mark suit I ended up getting, but I totally agree with most of whats been said. They really aren't worth the $3.....I'd sooner buy a blind bagged Lego minifigure for that. The quality is meh at best......I didn't understand why they didn't go with the same type of mold any of the other Muggs are made like. Not detachable from the base and nothing moves was pretty disappointing. Yeah I bought one too....total waste. Wow - no Black Widow. Not a single, short-packed figure. I love the exposure that MODOK has been getting in recent years, but i still find it strange that we can get some pretty obsuce villains over leading female characters. I know i'm probably not the target audience, but i figure there are a lot more casual Avengers fans who would know who BW was over Modok or Kang.